Following the 2007 Intergovernmental Panel on Climate Change (IPCC)’s 4th Assessment Report, there is now increased certainty that observed changes in the Earth’s climate can be attributed to human activities. This has given rise to much concern and there appears to be strong political will to deal with human-induced climate change, for example, the then British premier Tony Blair said when he took up the presidency of the G8 at Gleneagles in 2005 that climate change is “probably, long-term the single most important issue we face as a global community”. However, the politics of climate change are far from clear cut. The current British prime minister, Gordon Brown, in a speech two weeks before the 2007 UNFCCC meeting in Bali – the first since the IPCC report – said that “… the role of government from now on is transformed. Once government objectives were economic growth and social cohesion. Now they are prosperity, fairness and environmental care.” It is important to note that environmental care is linked with two other governmental objectives: prosperity and fairness. Similar concerns can be seen in the famous Byrd-Hagel resolution of 1997 in which the United States Senate voted unanimously not to be a signatory in any agreement that contained the principle of ‘common but differentiated responsibilities’ in which developed countries bore the burden of mitigating climate change or which might harm the economy (Box 1) . The Senate thus considered the Kyoto Protocol to be both unfair and damaging to prosperity. As the USA was at this time the major emitter of greenhouse gases, from this point on the Kyoto Protocol was irreparably wounded. Nonetheless, other countries, which had ratified the Kyoto Protocol, continued to implement policy aimed at meeting their Kyoto commitments. In 2003 the European Union passed the European Parliament Directive 2003/30/EC which promoted greater use of biofuels for transport as “part of the package of measures needed to comply with the Kyoto Protocol…”. But, as with other climate change policies, Kyoto was only one of three major policy objectives in the directive. The other two were creating new opportunities for rural development and the strategic need to reduce energy import dependency. The example of the biofuels directive neatly illustrates the fact that policy-makers are keen to have their climate cake (Kyoto compliance) and eat it too (multiple additional policy objectives). The same is true for reduced emissions from deforestation, a policy that was a major topic of discussion at the UNFCCC Bali meeting and which we now cover in more detail. The recent Stern Review on the economics of climate change  points out that 20-25% of global green house gas emissions are from tropical deforestation and suggests that reducing deforestation emissions is a cost-efficient mitigation option. Putting in place policy measures to reduce tropical deforestation also potentially meets two other major objectives. Firstly, about a billion people are dependent on forests in the tropics. Many of these are the poorest of the poor and helping them to improve their livelihoods could help to meet the Millennium Development Goal of poverty alleviation. Secondly, much of the world’s terrestrial biodiversity is found in tropical forests. Protecting these forests will go a long way towards fulfilling the objectives of the Convention on Biological Diversity. 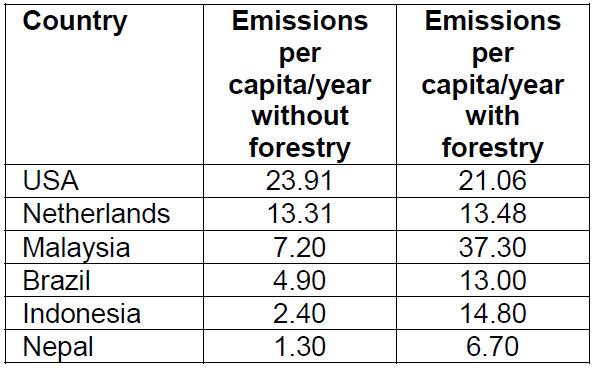 Analysis of country-level emissions with and without forestry shows both the magnitude of forest-related emissions and their spatial distribution (Table 1). When forestry is included then developing countries with high deforestation rates have per capita emissions comparable to, or exceeding those of developed nations. Under the Kyoto Protocol Clean Development Mechanism (CDM) it is possible to obtain funds for afforestation and reforestation by planting new forests to act as new carbon sinks. These funds are for new plantations in areas not covered by forest in 1990 and come with many restrictions and high transaction costs. So far only one project has been approved, in China, and in no way does this process counter the problem of deforestation. In contrast, the policy of Reduced Emissions from Deforestation in Developing Countries (REDD), which was introduced by Papua New Guinea and Costa Rica in 2005  and which is currently under discussion by the UNFCCC [5,6] includes deforestation, degradation and sustainable management. The option being considered is that a reference scenario for national rate of deforestation is established for each country participating. Then, over the commitment period, the actual rate of deforestation is monitored and compared to the reference scenario. Improvements in deforestation rate are translated into tonnes carbon equivalent and some form of compensation will be paid. The scheme would be entirely voluntary and the payments would be made on a national basis, rather than for a specific project as in the case of the current clean development mechanism. Use of the carbon payments would be a matter of national sovereignty to be used however the government sees fit. This proposal is contentious. A country, such as India, which has historically looked after its forests, will have a lower rate of deforestation as a reference scenario than a country such as Brazil, which has a high rate of deforestation. Brazil thus stands to gain more through changes in its deforestation rate. The proposed national-level scheme of payments is designed to prevent a country lowering deforestation in one part of the country whilst stepping it up elsewhere. This kind of safeguard is necessary for the integrity of the policy. However, this means that if some stakeholders work hard to reduce deforestation in one area while others continue to destroy forests elsewhere, there will be no overall gain and therefore no financial payment, which means that setting up an internal payment system to encourage actors such as community groups to maintain their forest, is rather complicated. There is also disagreement internationally about how the funding would work. Some Parties to the UNFCCC support a market based system with credits to trade against emission reduction targets of the industrialised countries, while others, such as Brazil, would prefer the establishment of an internationally managed fund to help counter deforestation. There are also concerns about the rights of people traditionally dependent on forests. Local people could be alienated from forests in the name of “conservation” and carbon funds might be used to enforce restrictive laws without consideration of local needs. This rises of the question of who owns the carbon. One may assume that where forest land is held privately, the carbon savings are the property of the land-owner, but in cases where local communities live in, and have for generations utilised forest that is nominally state owned, the situation is not so clear. Furthermore, the biodiversity conservation objective may also need value attached to it. In the rest of the article we will focus on community forestry and discuss the possibility of local communities carrying out their own inventories and monitoring of their carbon stocks. Large scale logging and land clearance generally requires capital for the equipment needed; almost by definition, this does not involve poor people. However, when forests are used by local people for their subsistence needs (for firewood, grazing or low level shifting cultivation) they can lose carbon through degradation. Until recently very little attention has been paid to the methodology of measuring this type of degradation, though it has certainly been grossly underestimated. The potential for avoiding loss of carbon through degradation is the linking factor between REDD compensation policy and poverty alleviation. Implementing community forest management with funding from REDD could form the basis for large-scale involvement and empowerment of forest dependent people in combating carbon emissions. The numbers are compelling. If we take the example of seven dry forest countries in southern and eastern Africa where there is no primary undisturbed forest remaining, and where we estimate off-take of products through community use to result in a net annual reduction of biomass stock of 0.9-2.3 tons/ha/year, then the total carbon emissions due just to this degradation is on the order of 178m tons CO2/year for the seven countries. Payments based on opportunity costs needed to prevent degradation are $0.7-$1.8 per ton CO2 , so if we take a relatively low value of $10/ton for compensation of avoided carbon dioxide emissions, then REDD could generate around $1424 million/year for poverty alleviation through community forestry in the seven countries. Community forest management is a well development instrument and institution in many countries including Tanzania, Nepal, Philippines and Mexico. Under most CFM arrangements the rights and responsibilities with regard to natural forest management are vested in local communities, including rights to products in kind and income from sales of timber and non-timber forest products. Management is usually administered by a local committee through by-laws on off-take, plus protective measures such as fire prevention and patrols against unauthorised exploitation. Rewards may be distributed in different ways, often through a village fund. Thus developing a REDD policy which includes opportunities for community forest management to receive financial rewards also helps over come some of the equity concerns associated with national-level payments mentioned earlier. A REDD policy based on community forest would be building on a well established model, about 17% of the world’s forest is under community control and the proportion is increasing, though not all of this is managed sustainably or in a ‘planned’ way. Much of this area involves poor communities. If it where possible for there to be community measurement of the forest carbon stock, then there could be grounds for a local ‘claim’ on the carbon and the communities would be empowered to manage their forests. Moreover, local measurement would be cheaper than professional forest inventories and so reduce the transaction costs of implementing the policy. The Kyoto: Think Global Act Local (K:TGAL) project is currently working on 25 sites in seven countries (Senegal, Mali, Guinea Bissau, Tanzania, Nepal, India and Papua New Guinea) with four regional teams. The project trains people to measure the carbon stock changes in their forest and assesses the carbon impact of community forest management together with quantifying the transaction costs of carbon credits and potential social benefit of carbon credits. The results are encouraging. Villagers with 4-7 years primary education can handle mapping and inventory with only limited support necessary, especially for maintenance of computers. The community forests assessed are accumulating carbon at 5-10 tons CO2 /ha/year, not including an allowance for degradation avoided. Transaction costs are highly subject to economies of scale related to supervision costs. REDD policy is still under discussion by the UNFCCC and is not without problems. Some environmental lobbies oppose it on the grounds that emissions from forests are not of the same nature as emissions from fossil fuels. However, it has been give a very favourable review at the Bali conference and a wide range of different Parties are agreed that some policy in this area is needed. Will only the carbon emissions avoided by stopping deforestation be rewarded, or will emissions from reducing degradation rates also be included? What about the additional carbon that is sequestered when forests stop degrading and start to return to their original healthy state? How will changes in deforestation and degradation rates be measured and verified? Will the money come from carbon credits or from a fund managed by an international panel? Debates in the coming months will be crucial to resolving these issues and to formulating a policy which is effective from a carbon point of view, straight forward to implement, and of benefit to millions of forest-dependent people. Nicholas Stern, The Economics of Climate Change: The Stern Review, Cambridge University Press, 2007. E. Trines, N. Hoehne, M. Jung, M. Skutsch, A. Petsonk, G. Silva-Chavez, P. Smith, G-J. Nabuurs, P. Verweij and B. Schlamadinger. Integrating agriculture, forest and other land-use in future climate regimes. Netherlands Programme on Scientific Assessment and Policy Analysis, (WAB) Climate Change, 2006. M. Skutsch and H. T. A.. Bressers, Power, motivation and cognition in the construction of climate policy: the case of tropical forestry. In V. Grover (Ed. ), What Future for the Kyoto Protocol? Oxford University Press, Oxford, 2007. M. M. Skutsch, E. Zahabu, M. K. McCall, S.P. Singh, E. Trines, J. C. Lovett, J. J. Verplanke, B. S. Karky, P. van Laake, K. Banskota and R. Basnet, Forest degradation, poverty and the carbon market, Proceedings of the National Academy of Sciences U. S. A., in review. Jon Lovett has researched both the potential impacts of climate change, particularly in Africa, and the institutional economics of community forest management. He is founding director of the Centre for Ecology, Law and Policy at the University of York, and is also Professor of Sustainable Development at the University of Twente in the Netherlands. Margaret Skutsch is Associate Professor at the Technology and Sustainable Development Group at the University of Twente. She has worked on community forest management issues in Africa and Asia since 1980, and is currently heading an international research project “Kyoto: Think Global, Act Local” which is investigating the potential for community forest management to combat emissions from deforestation and degradation. This article is based on a presentation by Professor Lovett at the ECG’s 2008 Distinguished Guest Lecture and Symposium ‘The Science of Carbon Trading’.